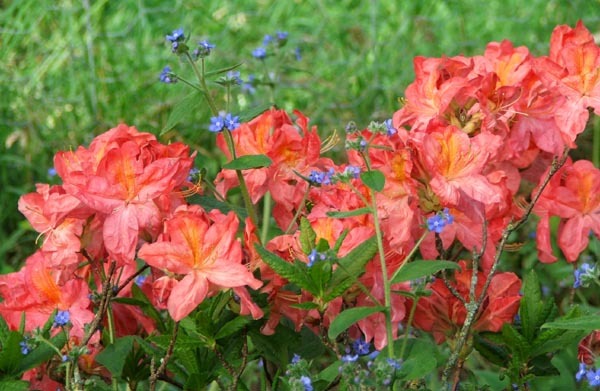 Two deciduous Azaleas were already living in the Moosey Garden when I first arrived. 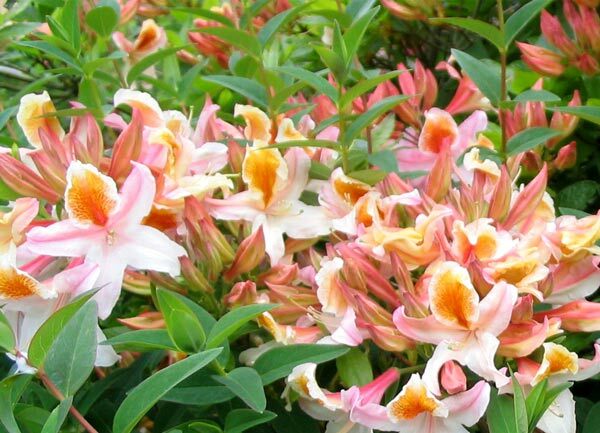 They both flower late in spring, are modest in size, almost hidden in the mixed plantings around them. 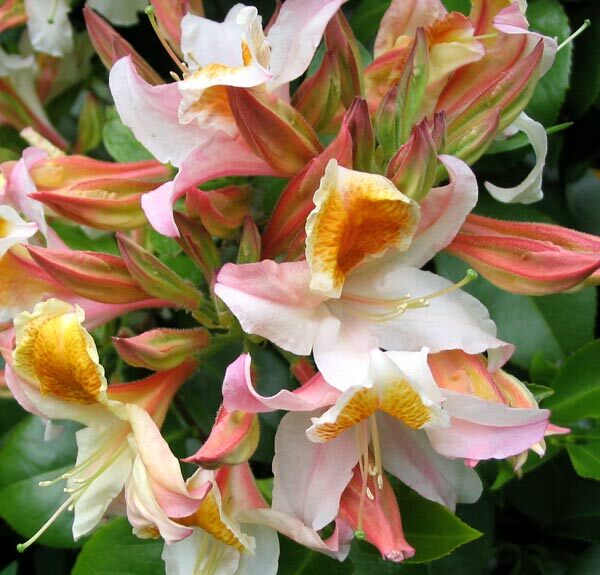 I suspect both are Ilam hybrids - bred in Canterbury, New Zealand - as are most of the older deciduous Azaleas in other local gardens. 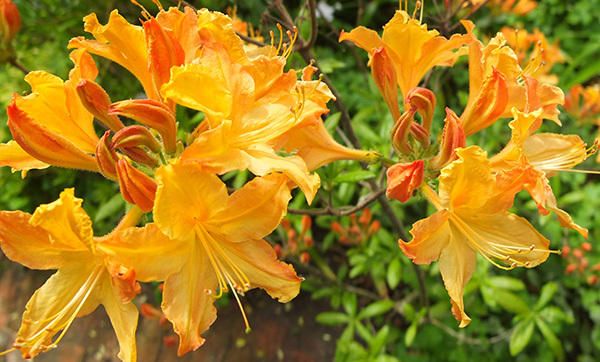 On a recent visit to the Ilam gardens, where these azaleas were bred and grown, I found examples of both Moosey azaleas. The shrubs in the botanic gardens were rather more splendid than mine though! I'll tell you why. The soil behind my pond is poor quality, despite my best efforts, and the irrigation won't reach here. It would have to be buckets of water twice a day throughout summer, I'm afraid. Alongside the brick path into the Koru courtyard I planted four new varieties, bought in a nursery sale. My records show these as two Golden Lights and two Melford Oranges. 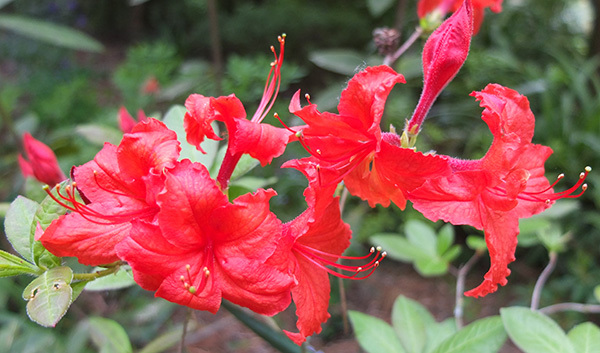 In 2008 I was lucky to be given a number of seedling Azaleas by my plant breeder friend. I was thrilled, even though were his rejects. They were initially planted all together at the first corner of the driveway, then shifted into a shadier garden by the brick courtyard. The colours are pale – a mixture of creamy yellows, and creamy apricots. They're still sulking a bit. And another Azalea (with label still attached) in the front of the driveway garden flowered for the first time last spring. She's a red-head, and has also been shifted out of the relentless summer sun. So far this spring - not one flower! Oops.